Nordic banks avoided the worst of the global economic downturn and bounced back much more quickly than their southern European counterparts. There are several reasons for this impressive resilience – the Scandinavian economy was less exposed to Europe, for one. But part of the reason Nordic banks fared so well during such a tumultuous time for the industry is that they responded quickly and effectively in order to remain appealing to investors and safe for customers. Sweden has some of the most progressive regulation in Europe, slowly brought in after a local banking crisis in the 1990s. Even before the most recent crisis, Sweden had one of the highest capital ratio mandates in the developed world, demanding that, from 2015, a minimum of 12 percent of assets should be core tier-1 – under Basel III guidelines that figure is only seven percent by 2019. There are plans afoot to boost up capital ratios even further as counter-cycle measures designed to buffer the local economy from further shocks. Though these measures may seem excessively stringent, Nordic banks are much better off for it, and as a result, Sweden’s banks have been generating some of the highest returns on equity in the region. In 2013, the Swedish government sold its remaining stake in Nordea, at the time of the sale shares were up 28 percent that year. The Nordic banking industry has undergone tremendous ­– if perfectly calculated – change over the past half a decade. But these changes have ensured unparalleled capital adequacy and asset quality, ensuring that macro-economic trends continue ticking up in the region. Nordea has been leading the industry in terms of adapting to the new industry environment without sacrificing the quality of its services. The bank is a shining beacon of hope in the European industry’s horizon. Its strong performance, adaptability, and resilience in the face of a crisis can be emulated across Europe. Nordea is an even more vital role model since the financial crisis of 2007-08, as it has since been completely denationalised. When the European banking industry almost collapsed six years ago, a number of banks across the region were taken under governmental control; now many of these authorities have been left with no coherent strategy about how to return banks to the public domain. Sweden’s phasing out of Nordea took over two decades, but it was done in a meticulous way. It proved that banks can be safe and profitable in equal measures. With operations in seven countries including the Nordics, the Baltic countries and Russia, more than 10.5m retail customers, more than 500 corporate and institutional relationships and more than 1,000 branch offices, Nordea is the most diversified bank in the region. Clausen says: “As the last five years of recession and mediocre growth have proven, strong banks are vital not only for financial markets but for society at large. 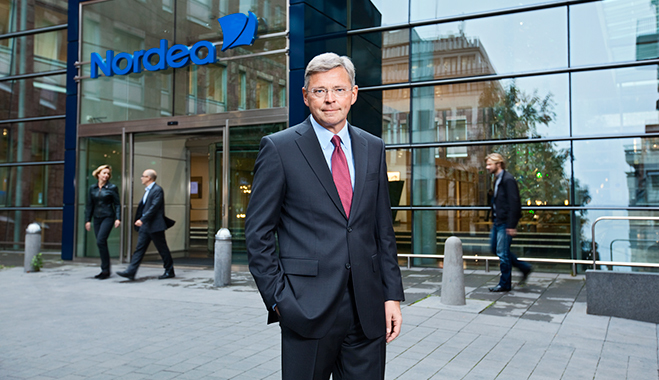 Throughout the crisis, Nordea has been a stabilising force in society, serving more customers and doing more business. Nordea is continuing to adapt to customers change in behaviour by building a solid platform for future business. While branch offices are handling advisory services, Nordea is increasing its call centre capacity and is now offering twenty-four-seven services in the Nordic countries and increasing other ways of meeting and advising the customers. Net meetings and secure chat functionality are other ways of meeting the customer on their terms, making it all the more convenient to be a customer of the bank. In addition, there has been a rapid increase in the use of mobile solutions for everyday banking. Nordea’s mobile offerings are looking at an increase of more than 1,000 new users per day in 2013. Clausen says: “We pursue a multichannel distribution strategy. The aim is to improve customer satisfaction while reducing the cost of service. Proactive contact with our customers is conducted through local branches, supplemented by contact centres, video meetings, online services and the mobile bank – the latter of which is becoming increasingly important. “Our strong financial platform is fundamental to the ability to deliver on our relationship strategy and our most important value – creating great customer experiences. Everything everyone does at Nordea has one purpose only – to create great customer experiences. At every level of our organisation, this message is the most important guide for every action and decision taken. We strive to understand our customers’ needs and help them realise their aspirations. This is the core of our relationship strategy – ensuring financial stability for our customers, leading to high satisfaction and closer, long-lasting relationships. In turn, these closer relationships lead to reduced risk for the bank. Nordea is fulfilling its ambition to be the preferred speaking partner for the large corporates in the region, leveraging on a multi-local presence in the Nordic markets combined with size and competence that matches international competition. Clausen says: “In our wholesale banking operation, our size, scale and financial strength enables us to meet any financial need of our customers. With €233bn of AUM, Nordea is by far the largest asset manager in the Nordics. A steady growth in the Nordic market has been complemented by a strong inflow from their global fund distribution. In May 2014, Nordea was awarded third place in Mackay Williams’ ‘Fund Brand 50’ report; the report measured which asset managers European customers wanted to do business with over the next 12 months.